All the fighters slated to participate in Saturday night’s “UFC 117: Silva vs. Sonnen” event will be tipping the scales today inside Oracle Arena in Oakland, California. 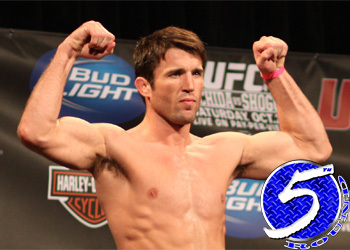 Stream today’s weigh-ins live right here on 5thRound.com starting at 7PM ET/4PM PT. UFC 117 features the middleweight grudge match between Chael Sonnen and champion Anderson Silva. The planet’s top 185-pounder has allowed his challenger’s comedy tour to dominate the pre-fight promotional requirements, however “The Spider” has promised to close the show when the lights come on. Sweetening the pay-per-view pot is the welterweight scrap between Thiago Alves and Jon Fitch. UFC president Dana White announced during yesterday’s pre-fight press conference that the victor will advance to a title fight in their next outing. Speaking of top contender bouts, the winner of the heavyweight contest between Roy Nelson and Junior dos Santos will also be reward with a championship affair in their next Octagon foray.